Packed up early and headed out in plenty of time to get to Hubby’s acupuncture appointment in Murfreesboro in the afternoon. His only real health problem now, other than being on dialysis, has been the pain in his lower back. He’s convinced that when we solve that, he’ll be fit enough to resume riding. 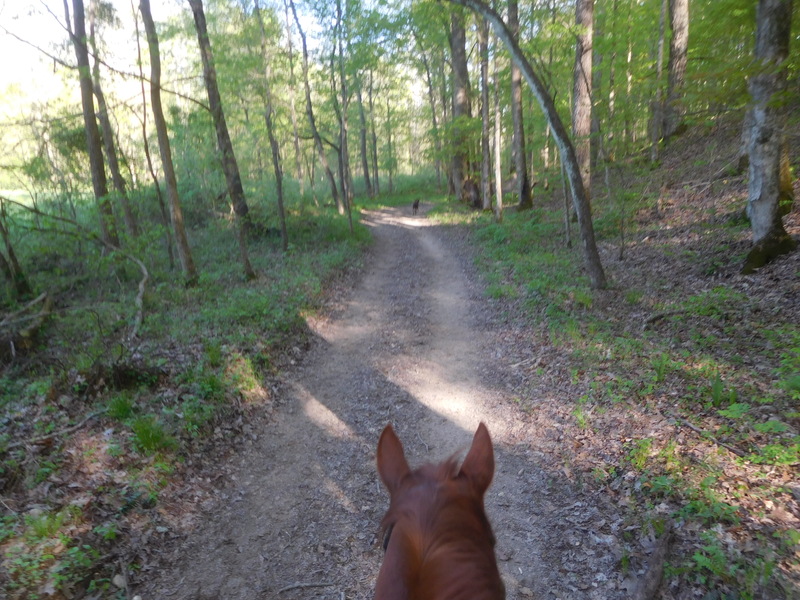 He’s been a little jealous of me going out on my own riding, and hates the feeling of being without a horse. We may solve that problem this week, though :-). The treatment did help, but we’ll have to have a few more to see just how effective it will be in the long run. Finally arrived home, unpacked the minimum, discovered the waterbed in the house was cold (Dottie had chewed partially through the electrical cord weeks ago, so it was only working intermittently), so we ended up spending the night in the trailer anyway. Driveway camping, yay! With plans to leave tomorrow, and after having such a short ride yesterday, I was looking forward to a longer ride with Apollo today. 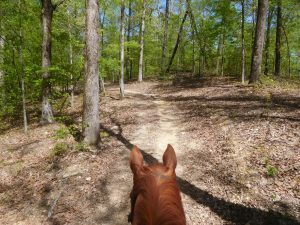 He seemed much more willing, so evidently he had rested well, so after our usual Sunday blueberry pancake breakfast, I saddled up and headed out of camp. I decided to do the ride I had planned yesterday, now that I knew where the correct trailhead was. 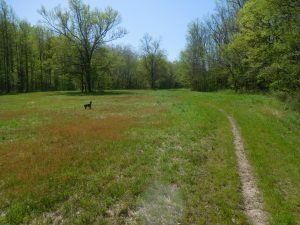 I kept Lola on a leash until we crossed the road our of the pasture area, and our first sight was a fairly long and rocky climb. Not too thrilled at that auspicious beginning, I was hoping things would improve, and thankfully, they did. In fact, today was the best ride here yet. Now that it had been dry a couple of days, many of the mud patches were greatly improved, so that footing was better. Trail #9 was my goal today, and it was overall much better than anything I had been on so far. There were still a few gravel spots, and a few mud spots, but there were also some wonderful fields where we could stretch out. Some areas were like a country lane, and some were more like a forest road, but there wasn’t anything like a single track trail, which is our preference. I managed to stay on track this time, there were actually a couple of extra confidence markers on this trail, so I was much more at ease. Apollo also seemed to enjoy himself a lot more today. He’s really been good this past month, he’s gotten so calm and mature, I haven’t had to worry about a thing! That’s always a good thing :-). I put him on his anchor yesterday, and he was surrounded by horses on highlines in the campsite next to us (the place was packed by Saturday morning), and he didn’t even give them a second glance! Anyway, I met a couple at a rest area who had been out all day and weren’t sure where they were, so I showed them on the map where we were, and they were surprised they had gotten so turned around. At that point, I had originally planned to veer west to Trail #5, but it had already been two hours, and I figured that I was only halfway, so I decided just to stay on Trail #9, which would be a slightly shorter route back to camp. So off we went, down more forest roads and country lanes, until we arrived back at camp. As I was crossing the barn area, I once again met up with the folks from the rest area, they evidently made it in pretty good time! I understood they were going to come back on Trail #9 in reverse of what I did, so I guess I was just about halfway when I met them! By the time I got back to our campsite, it was about 4:30, and the entire loop was empty except for us. It really emptied out in a hurry! I put Apollo up and did some preliminary packing in preparation for our trip tomorrow, and Hubby and I relaxed for the rest of the evening. 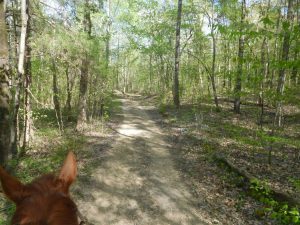 Saturday, April 28, 2017 – 2nd Ride at Wrangler’s Camp, Not Fun! Okay, so I know that a lot of people really love this place, but frankly, I'm not getting to like it any better the longer I stay here. After a good night sleep and a good dialysis session for Hubby, I was saddled up and ready to go before 1:30. 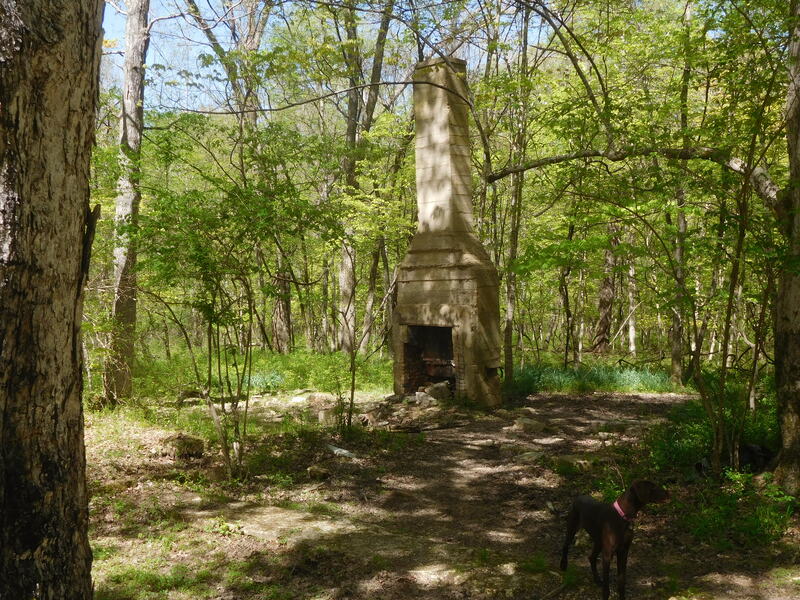 I had a plan mapped out, but once again, I couldn't determine exactly where the trailhead began. The trail map shows approximately where the trailheads start from the camp, but it's so small it doesn't really make sense, and the campground map has arrows pointing to the various trailheads, but don't mark WHICH trails they are the trailheads for! So once again, after struggling with Lola on a leash (they're very strict about leashes in camp, so even riding through requires a leash, which is very ungainly, and to my mind, pretty dangerous, but I understand that many dogs aren't as well trained as Lola, so I get it-don't like it, but get it! 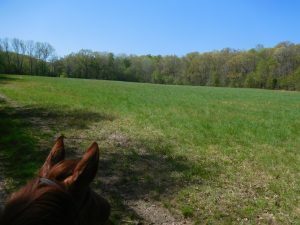 ), we reached the riding barn, which according to the map, was the beginning of the trailhead I wanted. 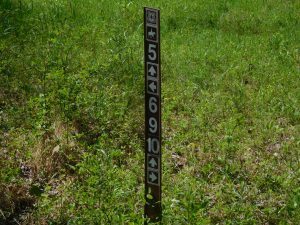 What it DIDN'T tell you is that the same trail numbers got out about 100 yards apart from each other, but you have to go all the way to the sign before you realize that, and since it had the same numbers on both signs, there's no way of knowing you're taking the wrong trailhead! So I once again headed down the trail in the wrong direction. Which is fine, I decided to take the trail backward. Until I got to the first intersection, where once again, there was confusion. According to the map, to take the loop I wanted to take, backward, I needed to make a left turn on trail 5. 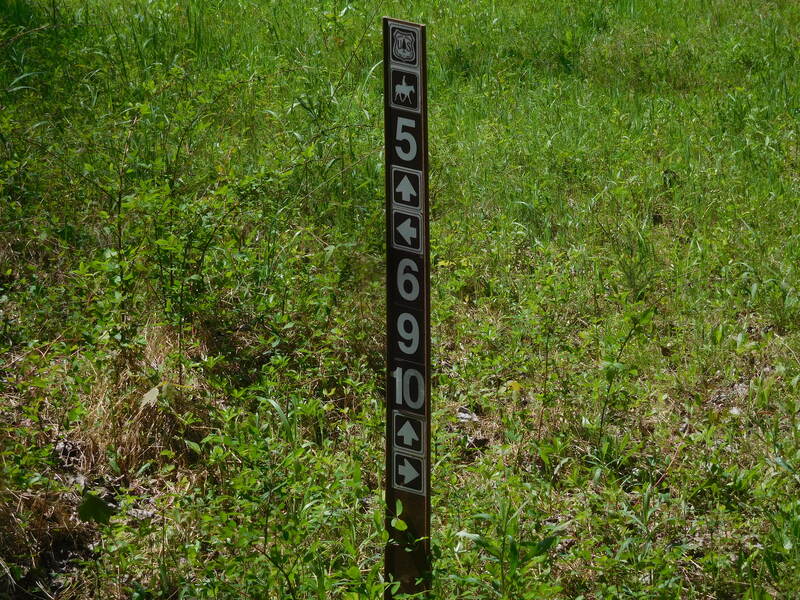 So when I reached an intersection that showed trail 5 going both left and right, I went left. Half a mile of struggling up and down muddy hills, passing another unmarked intersection and guessing which way to go there, I quickly realized I was headed straight back into camp! What the heck?? It turns out the first left wasn't really at the loop, I needed to turn right there, then make a left later! By now, Apollo had made it clear he was fed up with all the mud and gravel and was exhibiting distinct signs of exhaustion from yesterday, so I decided enough was enough, I wasn't going to torture us both any more. 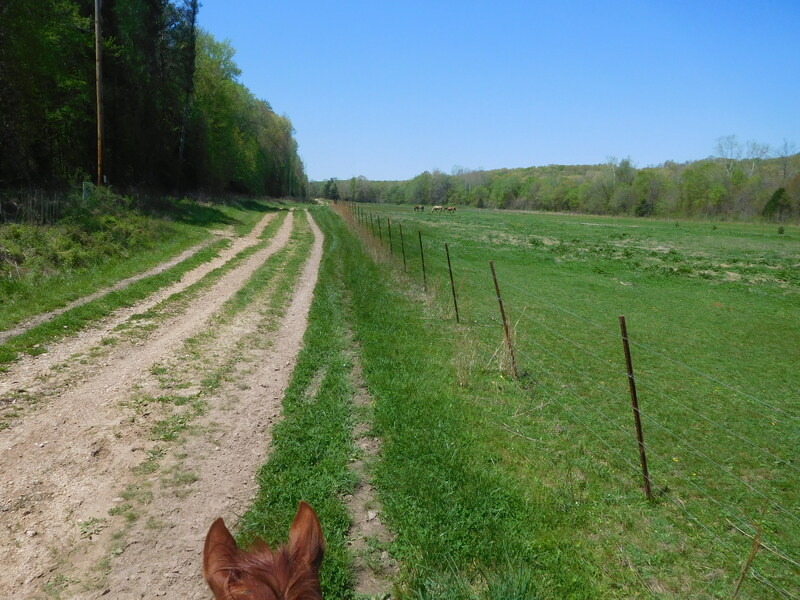 We headed back down the same boring county lane by the barn, where I hooked up Lola on a leash again, and headed through camp struggling with her. Hubby was surprised to see us back so early (me, too! ), but it just wasn't worth the aggravation. Hopefully Apollo will be better rested tomorrow and we can take a longer ride, or I may just decide to take another short ride, hopefully by the lake, which I hope will be more interesting, though I assume it's a popular trail, which means the hundreds of horses traipsing it will likely have left it even muddier than the other trails I've been on. Sigh. I really wanted to like this place more, but it's not happening. 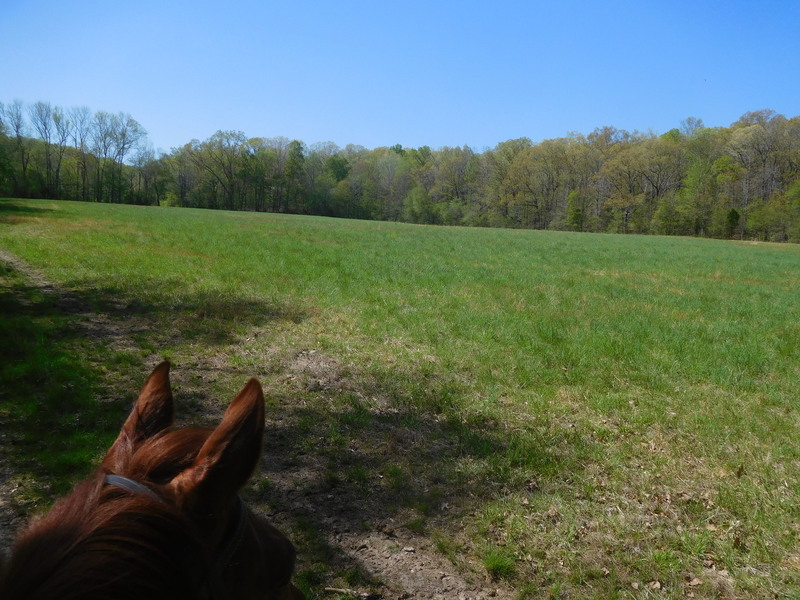 I will say that if you have a gaited horse and want to ride 20+ miles a day, this is probably great for you. 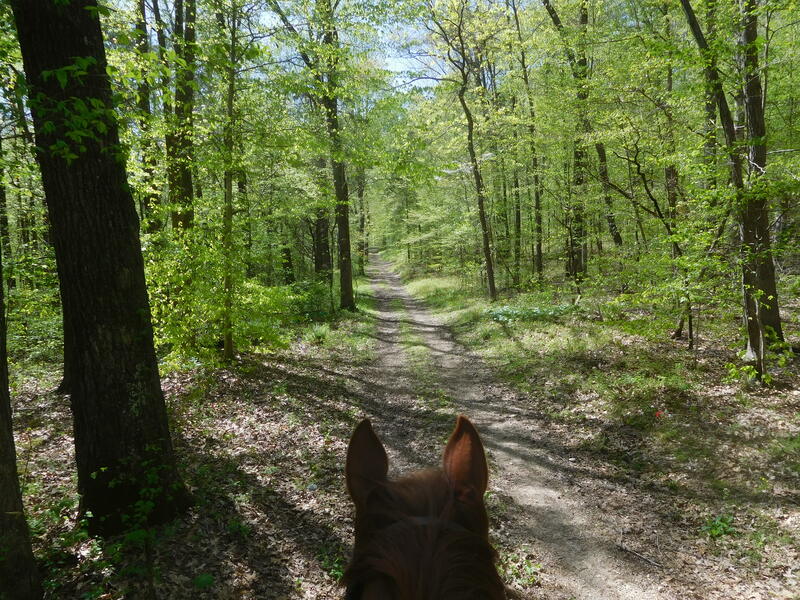 If you prefer buggies or wagons, there are plenty of trails for that, too. But for MY kind of riding, single track through the wilderness, this is definitely NOT my cup of tea! Got back after less than three miles, though it took us nearly 90 minutes, and spent the afternoon relaxing with Hubby, which was a nice change anyway. I can't WAIT until he has a horse and gets his back fixed so he can come with me! So it was a disappointing day, I'm sorry to say, considering this is the last weekend out for awhile, though we have a couple of horses we're going to try to take a look at next week, hopefully Hubby won't be horse-less for long, and naturally, I'm already starting to plan our next trip, as soon as possible! We love this life, even in a smaller-than-we-like trailer, it's still the way we want to live!! Got up early to dialyze Hubby, and downloaded my plan for my ride this afternoon. Got everything wrapped up (including having to retrieve Dottie from the kennel at the main gate, she somehow managed to slip out of both her collar and the new harness I bought for her last week!. Such a slippery girl! ), and was saddled up by 1:00. 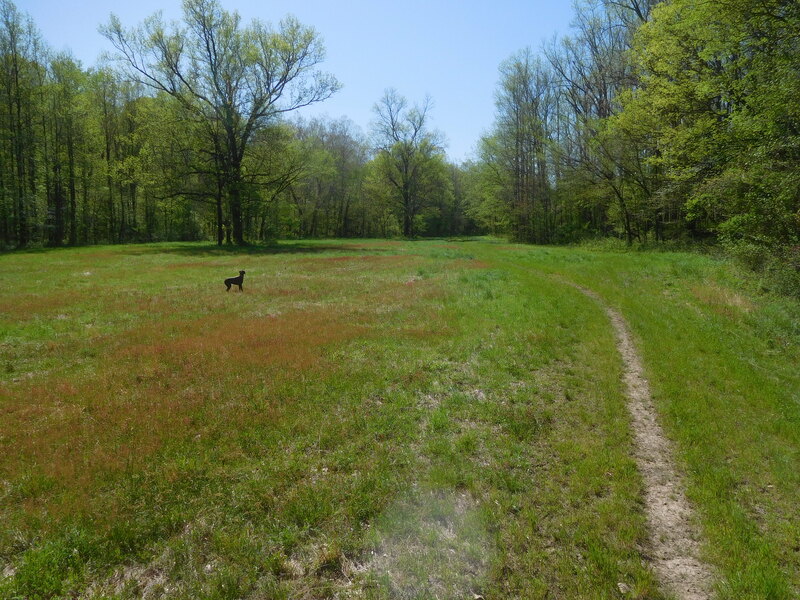 I had double-checked at the gate about dogs being on the trail, and evidently that's fine, as long as they're leashed in the campground, so Lola was able to come with us this time. I headed out the trailhead at the foot of our loop, and promptly missed the opening of the trail I had intended to take. By the time I realized the trail I was looking for didn't run into the trail I was on, I was too far along to turn back, so I kept going, revising my ride as I went. Unfortunately, the trail I was on was only a couple of miles long, and before I knew it, I was heading right back into camp. I looked at my GPS and reckoned that if I followed the utility line for a bit, it should take me to the back end of the original trail I had intended to take, and then I could do it in reverse. Turns out there are a LOT of trails out here that aren't on the trail map, and the one on the utility line quickly became a well traveled path that did, indeed, take me to the trail I wanted. I had no more trouble following the trails and map after that, though I'm a little surprised as how few trail markers they've put in, essentially only at the intersections, which are few and far between. No tree markers, not even a paint splotch occasionally to give one reassurance. If you miss a marker at an intersection, there's very little else to go on. I ended up doing a bit over eight miles, and I have to say, even though I love being on the back of my horse, this was a pretty boring ride. There was maybe a quarter of a mile of single track trails, all the rest were at least ATV width, some were full-on forest roads, and there was even a paved road or two that became part of the horse trail. Not my idea of interesting riding. 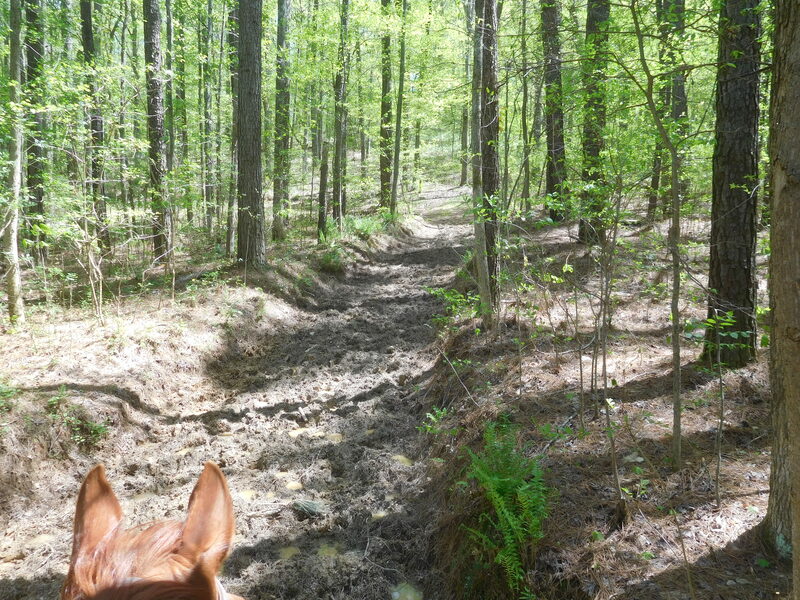 There was a lot of deep mud made worse by the hundreds of horse hooves that had plowed through them, and there was a honeycomb of alternative trails in many places, all trying to avoid the muck. 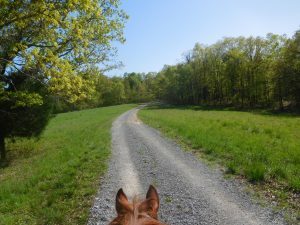 That didn't last very long, and was replaced by some heavily graveled areas (thank goodness I had put my horse boots on before leaving camp! ), and a lot of roads that circled around fields. It felt like I was riding on someone's farm. Not my favorite kind of riding. I'm hoping tomorrow's ride will be a bit more interesting, with maybe some more single track, wooded trails, but I'm not holding my breath. After a beer and dinner, remarkably, after not having a cell signal all day, it suddenly popped into one bar of 4G if it was left sitting in a chair outside, enough to start up Netflix and watch a few more Longmires before the battery on my phone crapped out. That was it, bedtime!! Woke up fairly early again this morning, got everything packed and ready to go in no time, had a quick bowl of cereal to save time, and headed out on the road for another uneventful 4+ hour drive to Wranglers Campground in KY. 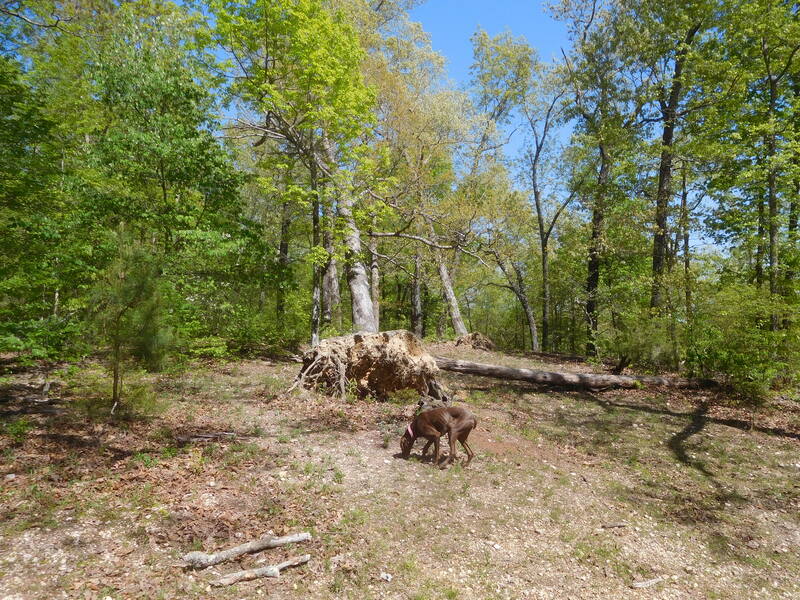 This was the very first place Hubby and I every camped with our horses back in 2001. We knew absolutely NOTHING back then! We had no idea how to picket from a highline at the time, so we ended up paying extra to put them in the barn, just because we didn't have any of the items necessary to do anything else. What a crazy memory that is! It looks like they've done some work here, expanded a bit, made it quite organized, and there are plenty of trailers already here, as this is one of the most popular places in the Midwest. We got checked in in no time, found our site #16 in Loop E back on the farthest loop out (away from the madding crowd, the way we like it) and got settled in no time! No doubt it will be full here this weekend, the forecast is for beautiful sunny skies every day, with temps tomorrow in the low 70's and upper 60's the rest of the weekend. Looking forward to doing some great riding, hopefully every day! Only downside here is the cell phone signal is really weak, and we're having a hard time getting Netflix, though we did manage to see a bit of Longmire before it crapped out on us. To bed early. Then, reading and catching up on my diary, so it was time well spent! This is one of those places that always make my mind say, "If Only." 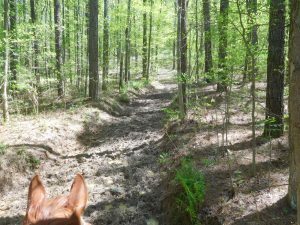 If only a local group of concerned riders or just regular citizens wanted to make this into a really outstanding horse camp, all they would have to do is... In this case, although the horse camp itself is pleasant enough, with electric on every site, water between every other site, a bathhouse with hot and cold running water and a shower in each bathroom, easy back-in sites, etc., what's missing are trails that are well-marked (which they're not), and horse-friendly (which they're not). The only trail map I could find on the internet was literally hand-drawn. Granted, I forgot to ask the camp host that checked me in for one (nor did he offer), but I got the impression from the hand-drawn map that the camphost was the one who made it, though I could be wrong on that. 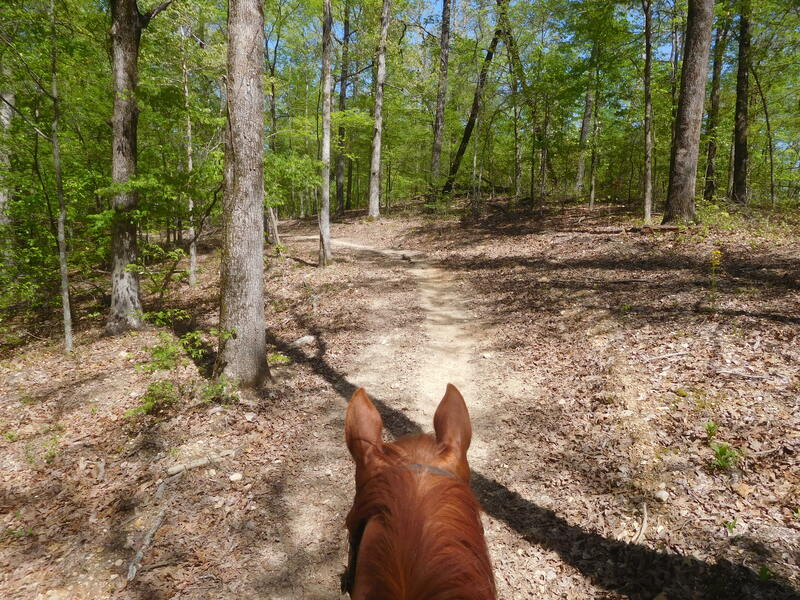 In any event, after dialyzing Hubby in the morning, I was saddled up and ready to go right after 1:00, with map in hand and my GPS programmed in with a plan that would cover most of the park, as best as I could make it out. Unfortunately, there's a bit sign at the trailhead saying No Dogs on Trail, so I left Lola back at the camp, though I wished she could have come along. 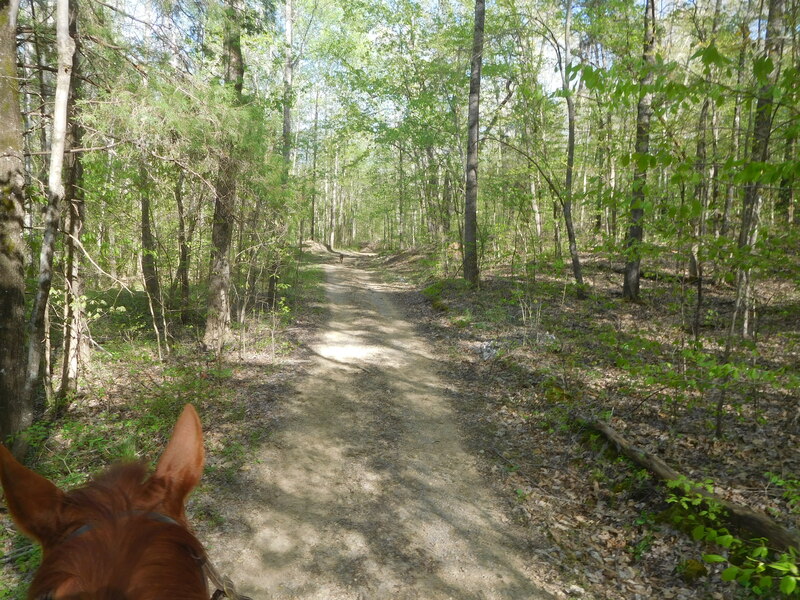 Apollo was on his best behavior, happy to be back on the trail, at least in the beginning. We had had some rain yesterday, so I knew the trails would be slick, and they were, but nothing too bad. What made it tough was that, first, there were no trail markings. I mean, occasionally I would see a paint splotch on a tree, but very seldom, and there was nothing on the map indication what "color" trail I was supposed to be on. There was that. Then we began running into some very steep grades, with no real switchbacks, just straight up and down. With all the rain, they were so slick that more than once Apollo was literally sliding down with his legs out front, mule-style. I had to make him go back and forth switch-back style on several occasions, just for safety's sake, but I hated going off the trail, not knowing what dangers might lay in the woods. Next, there were the downed trees. Dozens of them. Many had obviously been down for a long time, and alternate trails had been carved around them, but there was no excuse for someone, park-affiliated or otherwise, not to come and clean up some of these down trees. Some were in quite dangerous places, going up and down on steep slopes, which made it even trickier. Once we got further south, though, the terrain got a bit let slope-y, but the downed trees got even worse, especially through what would have otherwise been a nice pine forest. I got lost so many times it got old in a hurry. My GPS track wasn't even close to my plan, but I continued weaving back and forth trying to cover as many trails as I could. 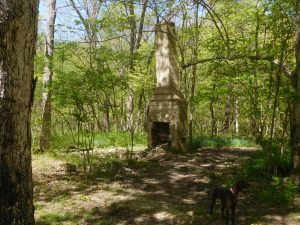 I ran into several people along the way; a group mushroom-hunting, and a fisherman along Shoal Creek, which Apollo and I forded in order to go see the birdhouses, which didn't really turn out to be much. At least on the other side of the stream the trails were a bit more reasonable. In the end, I did manage to cover just over six miles of trails, which, even though it wasn't every trail, it pretty much covered the park other than a few crossovers through the woods. 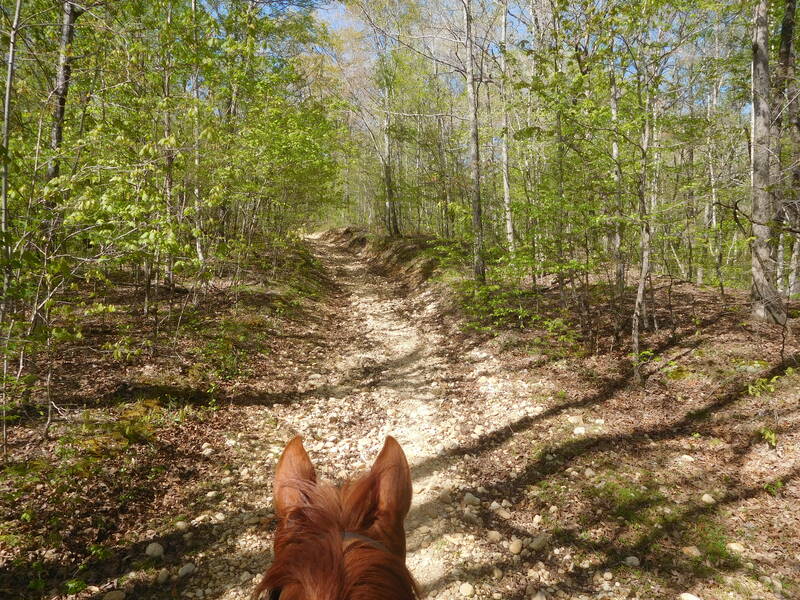 Towards the end of the 3-hour ride, Apollo started getting a little tired and cranky, reluctant to do the hard grades on the north side again, though it was the only way back to camp except the road, which I didn't want to do. He was a good sport in the end, though, and did everything I asked, without any tantrums, just a little hesitation, which I truly understood. He's nowhere near as fit as he used to be, and he was obviously tired, but we managed, yay! Got back to camp just after 4:00, got him cleaned up and put away, and stowed as much gear as I could for our early start out tomorrow. If Only... A saddle club or citizen group would clean up the trails of downed trees, created some alternative routes that included switchbacks instead of straight up and downs, marked the trails better and made a nice map, then this would be a really great place to spend a few days riding. Otherwise, I'd be hard-pressed to want to come back again. After a beer at the picnic table, explaining how Hubby would have HATED this ride, we eventually settled down for the evening. Well, as we had hoped, we managed to sleep in a little later than usual, yay! As small as this camp is, it had a dump, so we took advantage and got rid of all our excess. Still no running water yet, though, I guess there's still some freezing in the forecast! Dottie, our blue tick coonhound puppy, managed to escape at the last minute and refused to come when called, typical. Fortunately, a jogger was going by, and Dottie raced over to her to be petted, and the woman heard me calling for her and grabbed her for me, so that didn't delay us too much. Thank goodness for that jogger, thank you!! We stopped for diesel and breakfast, then hit the highway for an uneventful drive to Lake Lou Yeager. Someone at one of the horse expos and told me about this one. It's run by the city of Litchfield (which always make it tougher to find, as it's not generally listed on state or national sites), and has about a dozen electrified sites, a bathhouse with hot and cold running water, and a shower in each bathroom. I'm sure there's a dump at the main campground just across the road, but not one here in the camp. There are highline posts with a cable already attached, but since I like to give my guy more space, I put up my own highline with a pulley so he could move back and forth. I always like to put water at one end (or in the middle when we have two horses) and hay at the other, to keep him exercised at least a little bit. We had barely just arrived when Dave the camphost came by and took our money, $20 / night, then we settled in for the rest of the evening, crashing a bit from the hectic schedule. Whew! Back to our old selves again! Today we didn’t get to the Exhibit Hall until just before 8:00 when it opened, so we missed out on donuts (well, I managed to get a few later on when they restocked), and the traffic was, understandably, much slower today. My two presentations were at 11:30 and 1:00, almost back to back, and afterward, I took a walk to the barn to find out when the drop dead time to get Apollo out of his stall was. I didn’t want a repeat of what happened in Indianapolis to happen here, so I was taking every precaution. The person I found didn’t know, but she called me later to say that they would be starting to break down the stalls at 4:00 a.m. Darn it! We had hoped to spend the night here and not have to rush out after so many long, tiring days, but it looked like that plan was shot to hell. Hubby and I debated about just putting Apollo in the trailer for the night before we went to bed, or going to get him at 4:00 a.m. and doing it then, or trying to drive back down to Rock Cut. In the end, the decision was kind of made for us. After the event ended and we loaded out, just as I was putting the last of our stuff away, I went to wash my hands under the spigot, and they had turned the water off already! Well, that did it. We suddenly didn’t feel secure that they wouldn’t turn the electricity off in the middle of the night as well, so we rushed around and got everything loaded asap. Fortunately, by then, there was very little traffic waiting to get to the barn, so we headed across the parking lot and got Apollo and all his stuff loaded up by 7:00. That gave us just over an hour of daylight to make it to Rock Cut, which was just over an hour’s drive. We decided to take the direct route, which demanded a nearly $5 toll just to go one or two exits into Illinois, but it was better than arriving after dark. 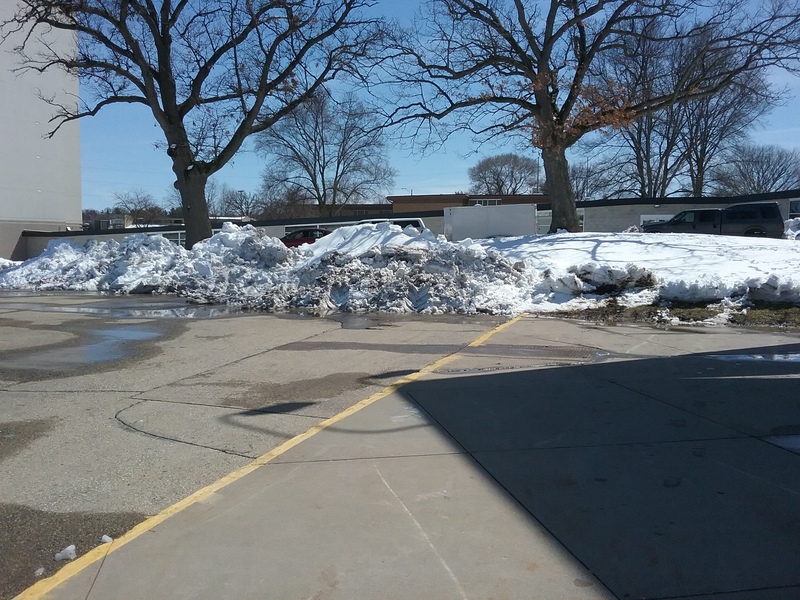 At least we weren’t dealing with snow this time! We arrived just as twilight was waning, but I managed to get Apollo set up in no time, and we settled in for the night fairly quickly. It’s only about 250 miles to Lake Lou Yeager from here, so there’s no point in getting up at the crack of dawn tomorrow, hoping to catch up on some zzzz’s tonight! After a long day yesterday, we both had a good night’s sleep and were raring to go this morning. Knowing that they would be blocking the area off early, we arrived at the Exhibit Hall before seven, and got a nice parking spot right in front of the building. I thought the building would be open by then, but we did have to wait a bit for someone to open the doors for us. Then we had a leisurely time getting the booth set up, having coffee and donuts from the Exhibitor’s lounge and getting ready for the day! It was another great day, with lots of book sales, lots of conversations with folks, and LOTS of attendees at both my presentations, even though, once again, I was up against Clinton Anderson in the room next door. Of course, he always packs them, SRO, but today they had changed his microphone to something a little less loud. Yesterday he was a bit overpowering using a hand mike, and his voice cut through the wall into my presentation, but today, my tech director changed it to a lavaliere mike, which I couldn’t hear at all, which was great for me and my class! It was great to see so many folks coming, and once I asked if anyone had been to any of my other presentations, and almost half the room raised their hands! I guess that’s the beginning of my fan club! I was so flattered! Anyway, after every presentation I had people stay to talk, and by the time I got back to the booth, Hubby had always sold a few books to people who had just come out of the class, just as we had hoped. By the end of the day, we were well satisfied at this event, and happy to be a part of it. I look forward to coming back next year, if they’ll have me! We had been told that the water would be turned on between 5:00 and 5:30, so I got up at 5:15, only to discover (not surprisingly) that it hadn't yet been turned on. I took the dogs for a walk, went to the barn to look after Apollo, and still, no water. Had breakfast with Hubby, still no water. Finally got Hubby in the truck and drove him over to the Exhibit Hall so he could finish setting up and looking after the booth while I went back and waited for water. Finally, about 8:00, the water, at last, came on. I had left the hose out in anticipation of an early morning fill-up, and of course, there was apparently some water left over from its last use, which froze up, so now I had to get out the kettle and boil some water to thaw out the hose, which took another 15 minutes. At last, I managed to get water through the hose and had the camper filled up by 8:40. I was FINALLY able to get my much needed shower, got dressed and headed back to the Exhibit Hall, only to discover that every road that led there was either closed off or so packed with cars I couldn't get around at all. I finally realized the closest place I could park and walk to the Exhibit Hall was actually back at VIP camping, so I headed back there, parked, and proceed to walk there. 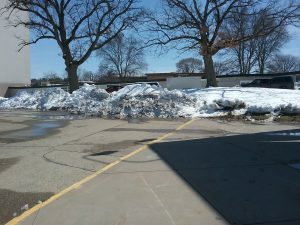 It was still close to freezing, but it was starting to warm up, at least, though there were still piles of snow from the plows cleaning up the days before. My first presentation started before I knew it, and the day flew by after that. I discovered from the schedule that TWICE over the weekend my presentations were scheduled at the same time and in the next room to Clinton Anderson! For those uninitiated, Clinton Anderson is literally a rock star in the horse training world. I didn't expect ANYONE in my sessions while he was on, but I turned out to be wrong, I had practically a full house, even with him next door! Very surprised at that! I had almost a full house at my second session as well, very pleased with that, and we had brisk book sales all day, too. Lots of people came by the booth, and the day flew by. Hubby had an afternoon dialysis session, but it was at the same time as one of my presentations, so he had to take an Uber there, which he did successfully, on his own, for the first time ever! His session wasn't done until after 8:00, so I was able to close up shop at 7:00 and get to him to pick him up in plenty of time. We grabbed dinner and headed back to the venue in time for the rodeo to be getting out, but we managed to get back to our camper without any trouble. Ready for bed tonight, that's for sure!